Kids love stickers. Kids love dinosaurs. Put ’em together and what have you got? Bibbidi-bobbidi-boo? 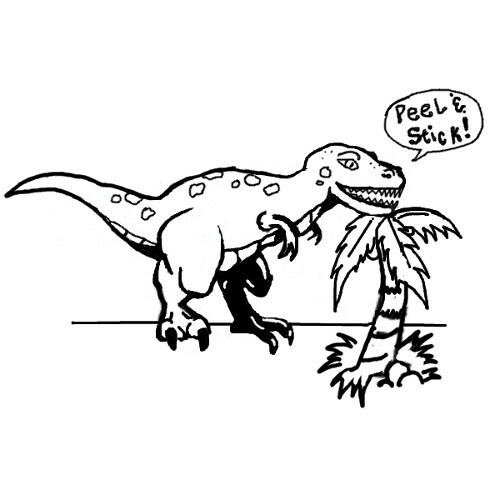 No, you’ve got (3) packs of (4) sheets each with (11) dino stickers from 1/2” to 2” tall on each, plus (9) other tiny palm trees, leaves, dragonflies and volcanoes. 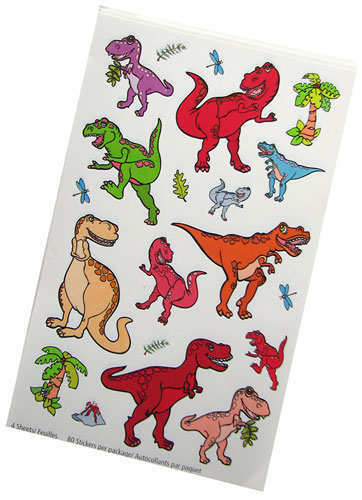 We’ll send you (3) packs containing a total of (240) stickers, (132) of them dinosaurs. We love math. For ages 3+. Made in Canada for a change. 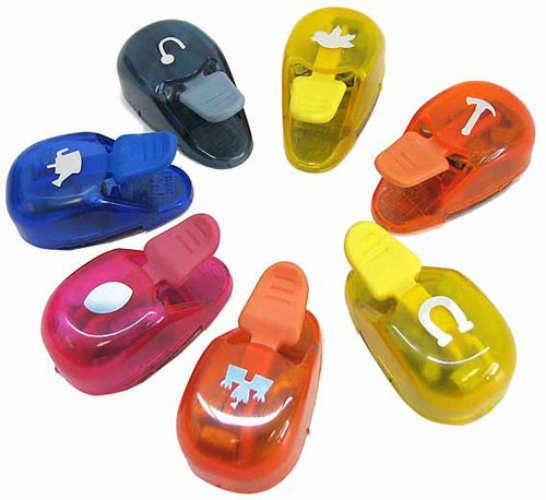 Our assortment of Paper Shapers are little thumb-punches for crafters, scrapbookers, artists and teachers everywhere. They're 2-1/2" long and they punch out shapes approx 3/4" across. You pick from a staggering array that includes a splash, patchwork, California, Idaho, tug-of-war, a zipper, a mountain range and more. 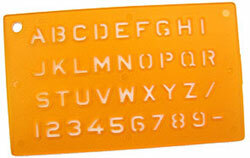 This set of alphanumeric stencils features 1-1/4" tall characters in a blocky, serifed typeface and includes the uppercase alphabet, numbers 0-9, a question mark, period, exclamation mark and ampersand. 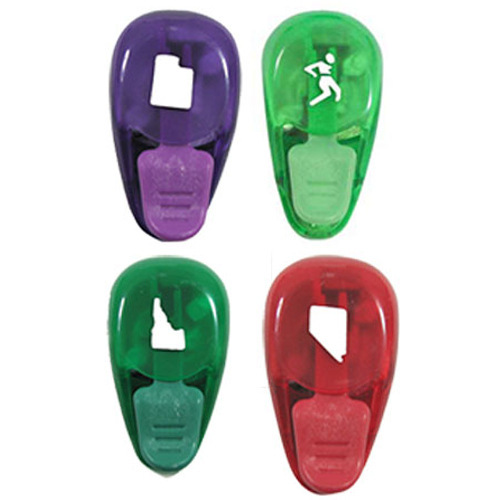 Each is on a separate, 2-3/4" tall x 1-3/4" wide red plastic tab. Because plain edges are for plain people. 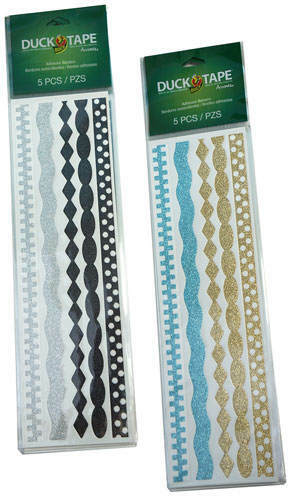 These adhesive border strips are, surprisingly, from the Duck Tape® people and include (6) sets of (5) 9-1/2” long x 3/8” wide strips, including zipper, wave, diamond, oval and perforated polka-dot patterns in gold and sparkly blue metallic strips. Each pack has (16) cartoonish alien stickers with googly eyes, but they're aliens, so some have two eyes but many have one or three, which is why aliens have a hard time buying glasses. Stickers range in size from 3/8" to 1-1/2" tall, just like the real aliens. Be the girl with the gold tattoo without making your mother crazy. 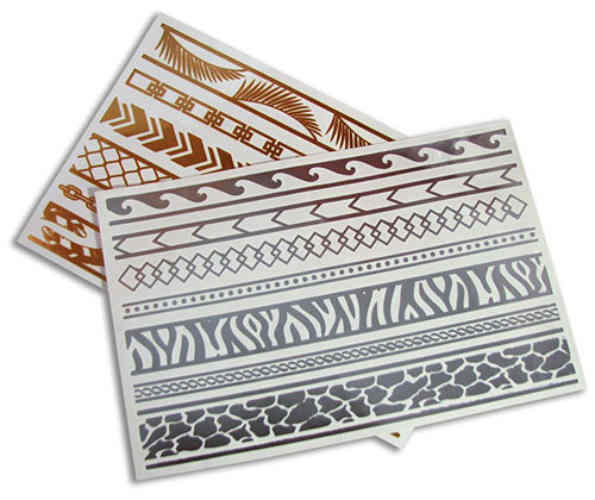 These gold (and silver) temporary tattoos are approx 8” long x 1/4” to 7/8” wide in various snazzy patterns, including golden feathers, chevrons and Egyptian-like designs; and silver animal-ish prints, waves and linking diamonds. Just moisten to apply. Great for wrapping around wrists, ankles, fingers and arms--or maybe necks, doubled up. Will last several days, so they’re good for more than one party. Remove them with baby oil when you’re going back to work. We don’t actually know if there are 4” tall princesses to stick these dress-up stickers on (we can’t stay on top of everything) but if not, your kiddie could draw her own. 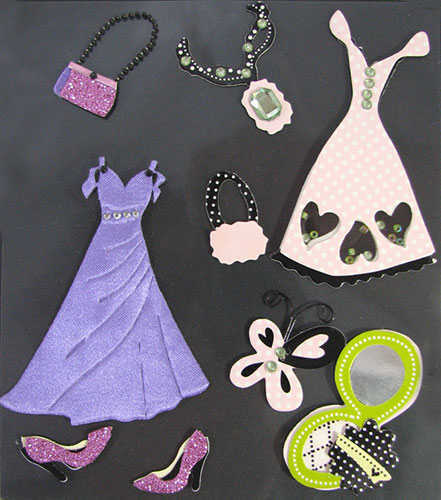 She gets (9) stickers, with (2) long (2-3/4”) gowns, a pair of glittery shoes, a handbag, (2) jeweled necklaces, a brooch and a compact. 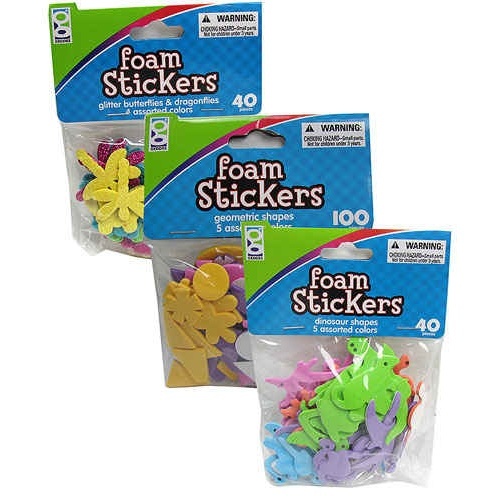 Or foam stickers. Think arts, crafts and kids. We’ll pick (3) packs, at least (2) different, from our selection of (40) glittery butterflies and dragonflies, (40) alphabet letters, (40) dinosaurs, and (100) geometric shapes. Most are between 3/4” and 1”, with some geometric shapes a tad smaller, and all are in a plethora of colorful colors. Call it the fussbudget's traveling label kit. This small plastic stencil is just 3-3/4" x 2-1/4" but has the full uppercase alphabet in a 1/4" sans serif font, plus numbers 0 to 9, a backslash, and a dash. And you get a pack of (10), so you can share them with (9) other fussbudgets, or your art class. 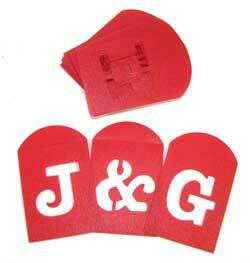 Start with our selection of punches from Paper Shapers®. We'll pick (5) different paper punches, with cutouts approx 3/8" to 1/2" across, from a staggering variety of shapes, including hammers, leaves, birds, state outlines, animals, fish, tools, geometric shapes and many others. The punches themselves are 2-1/2" x 1-1/4" ovals with a thumb press. 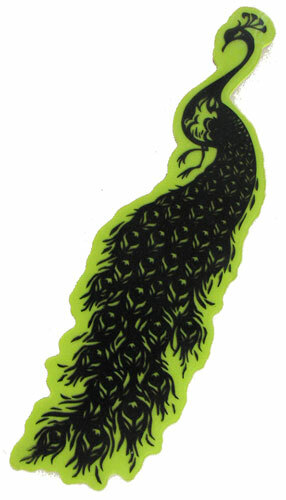 This rubber stamp has an unfurled but still a majestic 1-1/2" wide x 5-3/4" long Peacock. If you're a peacock too, try stamping this down the side of your personal stationary and making your friends jealous. This is a stamp only, so you'll need to attach it to some sort of handle--but that's easy for someone like you.